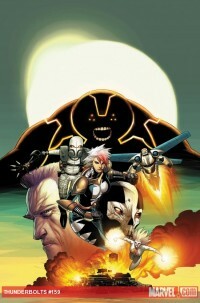 Jen has a story drawn by Eric Canete in Thunderbolts #159, on stands today. 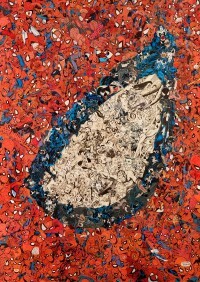 Check out a preview at Comic Book Resources! This weekend, Jen will be in Charlotte, NC, for the Heroes Convention, the annual affair put on by Heroes Aren’t Hard to Find. She’ll be at booth AA-604, signing copies of Hopeless Savages, Black Cat, Red Sonja, and the rest of her comicography! For more information, see our appearances page! Jen signs for Free Comic Book Day in Lacey, Wa. 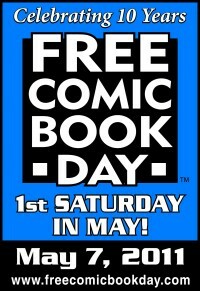 Free Comic Book Day is this Saturday, May 7, and Jen will be at Olympic Cards & Comics in Lacey, Wa. from 11:00 AM to 2:30 PM! For more information, check out the Olympic Cards & Comics website. When the Fear Itself hammer falls, The Raft is raised by one of its most powerful prisoners with a newfound weapon of the gods! Now the Thunderbolts will begin to learn the true meaning of FEAR ITSELF! Frank Tieri, Jen Van Meter & Joe Caramanga join series writer Jeff Parker to give us all sides of the story as the Thunderbolts try to hold themselves and their world together against tide of anarchy! O’Shea: After getting to know the characters, what are you most looking forward to drawing? McClaren: From what has been shared as far as each character’s story goes, there’s a lot in book 4 to look forward to. I’m particularly drawn to Zero and Rat, because their journeys are so often driven by identity discovery; but there are other aspects of the story that I already know will be hugely exciting for me. Hopeless Savages Greatest Hits came out in October, and collects all previous Savages stories in advance of new material out later this year! Written by Jen Van Meter and drawn by Edgar Salazar, the Red Sonja: Break the Skin one-shot is a must-read! In the story hitting comic shops this coming April, it looked like such a simple job: Zepur, a princess of the nomadic Talakma Horsemen, sought Sonja’s sword to defeat an unwelcome suitor and his army. When Sonja discovers she’s led her mercenary band into the middle of a bitter and vicious rivalry for leadership of Zepur’s clan, she’s got to figure out who’s lying to her the least, which promises she can keep, and how to fight the soul-eating avatar of an angry ape god. For the full press release, and previews of the issue, see the write-up at Comic Book Resources. Jen chatted with Shaun Hatton of Electric Playground at-length recently about the release of Hopeless Savages: Greatest Hits, and that video interview is now available at the Electric Playground site! Hopeless Savages: Greatest Hits was released in October and collects all three previous volumes of the Hopeless-Savage family saga, as well as B-Sides and web content. More stories featuring the punk family are coming from Jen, artist Meredith McClaren and Oni Press in 2011! Meredith McClaren was announced at NYCC as the artist for Jen’s next installment of Hopeless Savages, and subsequently shared a glimpse of what that book will look like. Check it out at Inquitous Fish. Hopeless Savages Greatest Hits in stores today! In addition to the final chapter of “The Inheritance,” which can be found in JSA All-Stars #11, Jen has another work hitting stores today: Hopeless Savages: Greatest Hits. 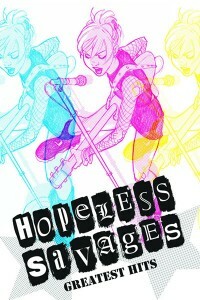 This trade paperback collects all previous Hopeless Savages stories in preparation for the family’s return in 2011. Oni Press will have copies available at this weekend’s New York Comic Con, where Jen will also be appearing. In addition to the booth appearances listed in the post below, Jen will also take part in the Oni Press panel on Sunday, from 1:15-2:15.